Archie’s “Sabrina the Teenage Witch” series, predicated on the outrageous idea of what if a witch liked boys and had to go to school or whatnot, captured the hearts of slightly cheesy children everywhere with its original Melissa Joan Hart adaptation. Well, you know what friend? This isn’t Melissa Joan Hart country anymore. No, no, no. You see the first trailer just dropped for the creepier Netflix adaptation, and I hope you find room in your already terrified subconscious to shiver and shake at the idea of Kieran Shipka’s more gothic, wry and satanic Sabrina in “The Chilling Adventures of Sabrina”. The series comes from comic book writer and Archie Chief Creative Officer Roberto Aguirre-Sacasa, and it follows a similar framework to his other big television adaptation, Riverdale. Riverdale is the CW crime drama that happens to have a character who can be described as “hunky Jughead” played by Cole Sprouse, and this series seems to play to the other side of the high school divide — that’s right, we’re talking spooky kids who take themselves hella seriously! 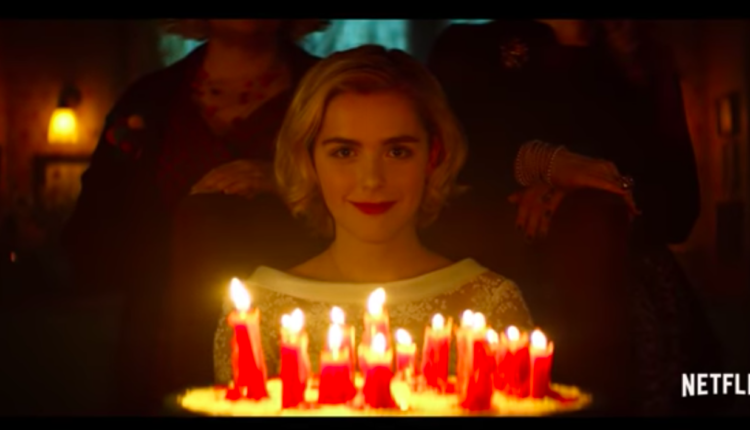 The trailer shows Kieran Shipka smooching up on boys, confronting demons, a dude is on fire, the color scheme is this reddish brown kind of thing, and scariest of all… people are singing “Happy Birthday” in a way that implies something sinister and cruel. Anyway. The Chilling Adventures of Sabrina is set to premiere on Netflix on October 26, 2018, a mere five days before Halloween, a big holiday for witch and the witch like alike (in MY opinion…). What do you think of the series? Let us know in the comments or on Twitter at @WhatsTrending.